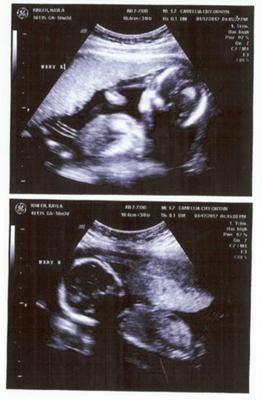 My very first ultrasounds Baby A on top, Baby B on bottom. I was surprised to find out 5 months ago that I was pregnant. I was in the process of moving out-of-state at the time, so it wasn't until I was settled in Louisisana before I went to the doctor. That was at 16 weeks gestation. My doctor said she was stuggling to distinguish the "heartbeats" and told me she was trying to make sure there weren't two in there. She then sent me straight into an ultrasound. The ultrasound tech confirmed that there were two and I was in total shock. My boyfriend and I had been joking about me being pregnant with twins my whole pregnancy up until then. She found no membrane between the two babies, and I was sent to a high-risk doctor. I was so afraid. I had never heard of this before and the term "high-risk" really frightened me. Now I'm a little over 5 months pregnant, and very excited for my little girls Raine and Brooke. They're both exactly 1lb 1oz and kicking up a storm! I will be going into in-patient care in about 6 weeks up until I deliver. I just hope they come out healthy.